There are two ways to create a roadmap in Roadmunk: from scratch or using one of our customizable in-app templates. In this article, we look at how to create a roadmap from template. To create a roadmap from scratch, go to Create a new roadmap from scratch. Our templates come with the fields, views, and even the data best suited to the roadmap's use case, so they practically do all the work for you. They're also a great way to get ideas and learn about roadmapping best practices by testing them out first. There are two ways to start creating a roadmap from template: from within Roadmunk or from the Template Library on our website. If you're signed in to your Roadmunk account, start creating a roadmap from template by going to your Roadmap Home. 1. On the Roadmap Home navbar, click Templates. 2. In the Templates panel, select the template you want to use. TIP: To preview a template before selecting it, double-click the template name. You can also get more details on each of our templates in the Template Gallery. 3. On the Roadmap toolbar, click Duplicate. 4. 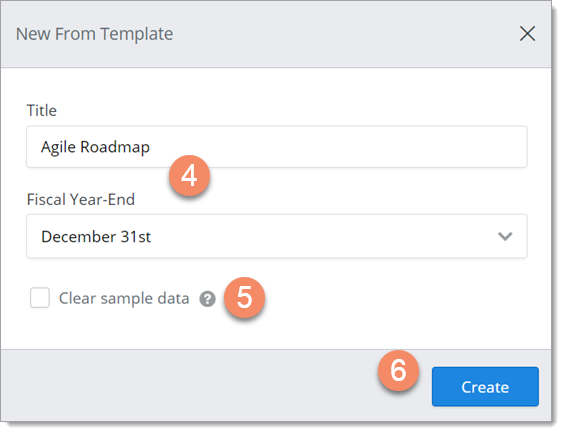 In the New From Template dialog, you can enter your own name for the roadmap (Title) and select a different Fiscal Year-End from the default. IMPORTANT: You can't change a roadmap's year-end after you save it. To find out how year-ends affect roadmaps, go to Why do roadmap year-ends matter further on the article. 5. If you don't want to copy the sample data in the template to your new roadmap, select Clear sample data. TIP: Every template comes with sample items that you can duplicate as well as roadmap fields and views, each with their own visualizations, filters, and data pivots (if you're not familiar with any of this, take a few minutes to go through our Quick Guide to Roadmunk). The sample data is really useful if you want to try out a roadmap before creating one of your own. 1. Go to the Template Gallery on our website. 2. 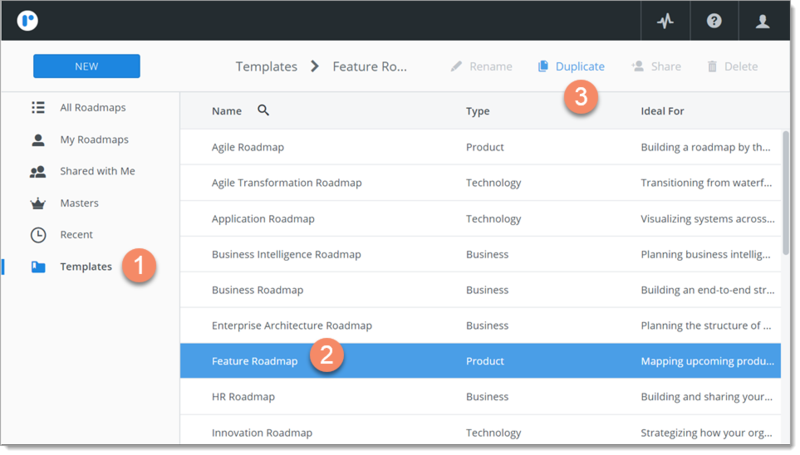 Browse the templates and select the one you want to use (for example, Agile Roadmap). 3. Read the instructions on the template page. If you don't already have a Roadmunk account, you can sign up for a Free Trial. 4. When you're ready to go, click Get your template. TIP: The descriptions and images of the roadmap views that come with the template will help you decide if a template is right for you. 5. Sign up or log in to your Roadmunk account. 6. Follow the steps in From within Roadmunk above. 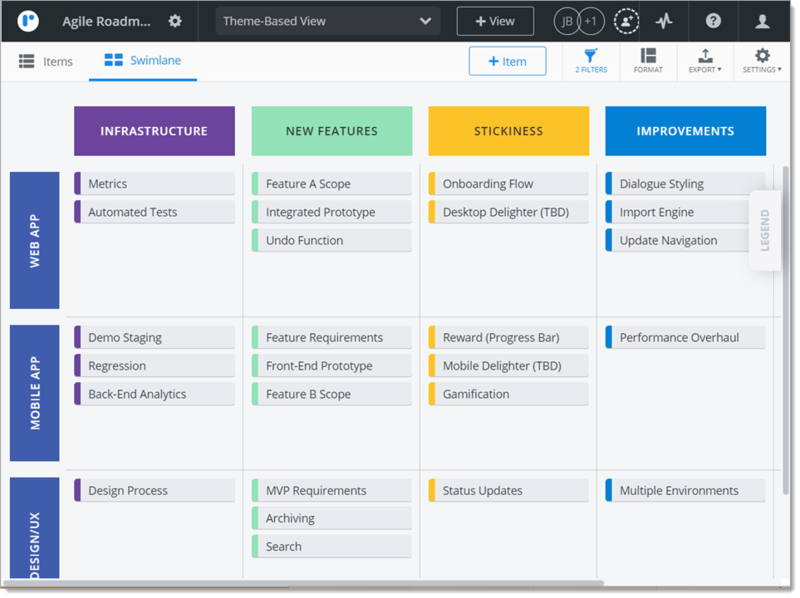 Here's a snapshot of what a roadmap created with the Agile Roadmap template looks like.